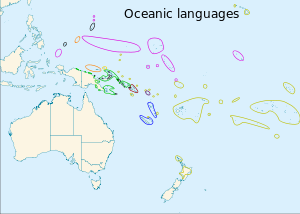 The black ovals at the northwestern limit of Micronesia are the non-Oceanic languages Palauan and Chamorro. The black circles in with the green are offshore Papuan languages. The Malayo-Polynesian languages are a subgroup of the Austronesian languages, with approximately 385.5 million speakers. The Malayo-Polynesian languages are spoken by the Austronesian people of the island nations of Southeast Asia and the Pacific Ocean, with a smaller number in continental Asia, going well into the Malay peninsula. Cambodia and Vietnam serve as the northwest geographic outlier. On the northernmost geographical outlier does not pass beyond the north of Pattani, which is located in southern Thailand. Malagasy is spoken in the island of Madagascar located off the eastern coast of Africa in the Indian Ocean. Part of the language family shows a strong influence of Sanskrit and particularly Arabic as the Western part of the region has been a stronghold of Hinduism, Buddhism and, since the 10th century, Islam. The Nuclear Malayo-Polynesian languages are spoken by about 230 million people and include Malay (Indonesian and Malaysian), Sundanese, Javanese, Buginese, Balinese, Acehnese; and also the Oceanic languages, including Tolai, Gilbertese, Fijian, and Polynesian languages such as Hawaiian, Māori, Samoan, Tahitian, and Tongan. Malay is also the native language in Singapore and Brunei. The Philippine languages are the most linguistically archaic branch of the Malayo-Polynesian language family, and are spoken by around 100 million people between Orchid Island Taiwan, the entire Philippine archipelago, and the northern part of Sulawesi Indonesia. Philippine languages include Tagalog (Filipino), Cebuano, Ilokano, Hiligaynon, Central Bikol, Waray, and Kapampangan, each with at least three million speakers. The Malayo-Polynesian languages share several phonological and lexical innovations with the eastern Formosan languages, including the leveling of proto-Austronesian *t, *C to /t/ and *n, *N to /n/, a shift of *S to /h/, and vocabulary such as *lima "five" which are not attested in other Formosan languages. However, it does not align with any one branch. Malayo-Polynesian consists of a large number of small local language clusters, with the one exception being Oceanic, the only large group which is universally accepted; its parent language Proto-Oceanic has been reconstructed in all aspects of its structure (phonology, lexicon, morphology and syntax). All other large groups within Malayo-Polynesian are controversial. The most influential proposal for the internal subgrouping of the Malayo-Polynesian languages was made Robert Blust who presented several papers advocating a division into two major branches, viz. Western Malayo-Polynesian and Central-Eastern Malayo-Polynesian. The position of the recently "rediscovered" Nasal language (spoken on Sumatra) is still unclear, but it shares most features of its lexicon and phonological history with either Lampung or Rejang. The Malayo-Sumbawan languages are a proposal by Adelaar (2005) which unites the Malayo-Chamic languages, the Bali-Sasak-Sumbawa languages, Madurese and Sundanese into a single subgroup based on phonological and lexical evidence. Additionally, Larish (1999) classifies the two Moklenic languages Moken and Moklen as part of a larger Moklen-Acehnese-Chamic-Malayic ("MACM") subgroup. The Greater North Borneo hypothesis, which unites all languages spoken on Borneo except for the Barito languages together with the Malayo-Chamic languages, Rejang and Sundanese into a single subgroup, was first proposed by Blust (2010) and further elaborated by Smith (2017, 2017a). Because of the inclusion of Malayo-Chamic and Sundanese, the Greater North Borneo hypothesis is incompatible with Adelaar's Malayo-Sumbawan proposal. Consequently, Blust explicitly rejects Malayo-Sumbawan as a subgroup. The Greater North Borneo subgroup is based solely on lexical evidence. Edwards (2015) argues that Enggano is a Malayo-Polynesian primary split. However, this is disputed by Smith (2017), who considers Enggano to have undergone significant internal changes, but was once much more like the other Sumatran languages in Sumatra. Additionally, Reid (2013) argues that Inati (Ati) is also a Malayo-Polynesian primary split. Zobel (2002) proposes a Nuclear Malayo-Polynesian subgroup, based on putative shared innovations in the Austronesian alignment and syntax found throughout Indonesia apart from much of Borneo and the north of Sulawesi. This subgroup comprises the languages of the Greater Sunda Islands (Malayo-Chamic, Northwest Sumatran, Lampung, Sundanese, Javanese, Madurese, Bali-Sasak-Sumbawa) and most of Sulawesi (Celebic, South Sulawesi), Palauan, Chamorro and the Central–Eastern Malayo-Polynesian languages. This hypothesis is one of the few attempts to link certain Western Malayo-Polynesian languages with the Central-Eastern Malayo-Polynesian languages in a higher intermediate node, but has received little further scholarly attention. ^ Hammarström, Harald; Forkel, Robert; Haspelmath, Martin, eds. (2017). "Malayo-Polynesian". Glottolog 3.0. Jena, Germany: Max Planck Institute for the Science of Human History. ^ Blust, R. (1993). Central and Central-Eastern Malayo-Polynesian. Oceanic Linguistics, 32(2), 241–293. ^ Ross, Malcolm (2005), "Some current issues in Austronesian linguistics", in D.T. Tryon, ed., Comparative Austronesian Dictionary, 1, 45–120. Berlin: Mouton de Gruyter. ^ Donohue, M., & Grimes, C. (2008). Yet More on the Position of the Languages of Eastern Indonesia and East Timor. Oceanic Linguistics, 47(1), 114–158. ^ Adelaar, K. Alexander, and Himmelmann, Nikolaus. 2005. The Austronesian languages of Asia and Madagascar. London: Routledge. ^ Anderbeck, Karl; Aprilani, Herdian (2013). The Improbable Language: Survey Report on the Nasal Language of Bengkulu, Sumatra. SIL Electronic Survey Report. SIL International. ^ Adelaar, A. (2005). Malayo-Sumbawan. Oceanic Linguistics, 44(2), 357–388. ^ a b Blust, Robert (2010). "The Greater North Borneo Hypothesis". Oceanic Linguistics. 49 (1): 44–118. doi:10.1353/ol.0.0060. JSTOR 40783586. ^ a b Smith, Alexander D. (2017). "The Western Malayo-Polynesian Problem". Oceanic Linguistics. 56 (2): 435–490. doi:10.1353/ol.2017.0021. ^ Smith, Alexander (2017a). The Languages of Borneo: A Comprehensive Classification. PhD Dissertation: University of Hawai‘i at Mānoa. ^ Smith, Alexander D. 2018. The Barito Linkage Hypothesis, with a Note on the Position of Basap. JSEALS Volume 11.1 (2018). ^ Edwards, Owen (2015). "The Position of Enggano within Austronesian." Oceanic Linguistics 54 (1): 54-109. ^ Reid, Lawrence A. (2013) "Who Are the Philippine Negritos? Evidence from Language." Human Biology: Vol. 85: Iss. 1, Article 15. ^ Fay Wouk and Malcolm Ross (ed. ), 2002. The history and typology of western Austronesian voice systems. Australian National University. Madurese is a language of the Madurese people of Madura Island and eastern Java, Indonesia; it is also spoken on the neighbouring small Kangean Islands and Sapudi Islands, as well as by migrants to other parts of Indonesia, namely the eastern salient of Java, the Masalembu Islands, and even some on Kalimantan. The Kangean dialect may be a separate language. It was traditionally written in the Javanese script, but the Latin script and the Pegon script is now more commonly used. The number of speakers, though shrinking, is estimated to be 8–13 million, making it one of the most widely spoken languages in the country. A variant of Madurese that is Bawean is also spoken by Baweanese descendants in Malaysia and Singapore. In linguistics, the Philippine languages are a proposal by Zorc (1986) and Robert Blust that all the languages of the Philippines and northern Sulawesi—except Sama–Bajaw and a few languages of Palawan—form a subfamily of Austronesian languages. Although the Philippines is near the center of Austronesian expansion from Formosa, there is little linguistic diversity among the approximately 150 Philippine languages, suggesting that earlier diversity has been erased by the spread of the ancestor of the modern Philippine languages. The Central–Eastern Malayo-Polynesian (CEMP) languages form a proposed branch of the Malayo-Polynesian languages consisting of over 700 languages. The Sasak language is spoken by the Sasak ethnic group, which make up the majority of the population of Lombok in Indonesia. It is closely related to the Balinese and Sumbawa languages spoken on adjacent islands, and is part of the Austronesian language family. Sasak has no official status; the national language, Indonesian, is the official and literary language in areas where Sasak is spoken. The Nuclear Malayo-Polynesian languages are a putative branch of the Austronesian family, proposed by Zobel (2002), that are thought to have dispersed from a possible homeland in Sulawesi. They are called nuclear because they are the conceptual core of the Malayo-Polynesian family, including both Malay and Polynesian. Nuclear Malayo-Polynesian is found throughout Indonesia, and into Melanesia and the Pacific. The Borneo–Philippines languages are a paraphyletic group of the Austronesian languages which includes the languages of the Philippines, much of Borneo, the northern peninsula of Sulawesi, and Madagascar. They can be divided into the Bornean languages and the Philippine languages. More than 700 living languages are spoken in Indonesia. A major part of them belong to the Austronesian language family, while over 270 Papuan (non-Austronesian) languages are spoken in eastern Indonesia.. The official language is Indonesian, a standardized form of Malay, which serves as the lingua franca of the archipelago. The vocabulary of Indonesian borrows heavily from regional languages of Indonesia, such as Javanese, Sundanese and Minangkabau, as well as from Dutch, Sanskrit and Arabic. The Bornean languages are a geographic group of Austronesian language families indigenous to the islands of Borneo and Madagascar, with the exclusion of Ibanic and other Malayic languages. There is little reason to think they form a genealogical clade. The Malayo-Sumbawan languages are a proposed subgroup of the Austronesian languages that unites the Malayic and Chamic languages with the languages of Java and the western Lesser Sunda Islands, except for Javanese. If valid, it would be the largest demonstrated family of Malayo-Polynesian outside Oceanic. The Malayo-Sumbawan subgroup is however not universally accepted, and is rejected e.g. by Blust (2010) and Smith (2017).